The team received the great gift of a week of consistent prayer, experienced first-hand the hospitality, smiles, and dreams of the Albanian people, and gained a greater understanding of the workings of missions and the value they provide to God’s great plan. 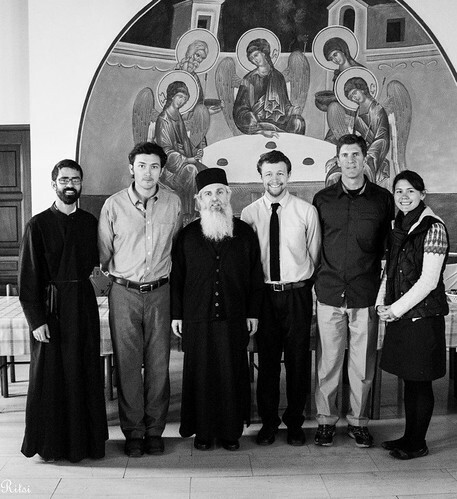 I recently had the pleasure of traveling on a mission trip sponsored by the Orthodox Christian Mission Center. The purpose of this mission trip was to contribute and participate in a new first annual conference for youth group leaders from around Albania. Our team was to prepare a presentation and facilitate a group of college-aged Albanian Christians. It was an absolutely wonderful experience. The four highlights for me were: 1) Achieving a greater understanding of the impact that Christianity had on restoring and redeveloping a country. In the case of Albania, it was the recovery from the darkness and hopelessness of Communism in 1992. 2) Receiving the great gift of a week of consistent prayer alongside my team and host family. 3) Experiencing firsthand the hospitality, smiles, and dreams of the Albanian people. 4) Gaining a greater understanding of the workings of missions and the value it provides to God’s great plan as well as to our growth towards theosis. It is not so much the work that we do in missions but the work that is done in us while doing mission work that is so impactful. As we were reminded by our host family, Deacon Stephanos and Alexandria Ritsi, this was not a “roughing it" missions trip. Our team experienced beautiful hospitality in the Ritsi home, along with sharing of great stories, many belly-busting laughs, and delicious Lenten meals, sandwiched in between conversations with God during our morning and evening prayers. There were three of us on our team. God orchestrated our meeting in Albania so that He could show each of us a glimpse of His great plan for Albania, as well as the next chapter for each of our lives. I thoroughly enjoyed my teammates and thank them for their insights and help in my journey. Before I arrived in Albania I was unfamiliar with how strong the Orthodox Church is in Albania. Thanks be to God and His work through Archbishop Anastasios, the Church in Albania has a strong infrastructure. There exists a breathtakingly beautiful new Cathedral in Tirana, a seminary in a surrounding community, and a nearby orphanage full of the most wonderful, joyous children that you would ever want to hear a song from, dance with, and share a hug. I remember one young high school girl would take us by the hand and show us how to dance one of their favorite dances. This young lady wants to be a lawyer someday. She is very sharp and a born leader! I was moved by how good God is for His work in saving these young people and giving them a future. In the heart of the university/college area of Tirana there is a welcoming study center for inquiring students of all faiths. Our team met there one night and shared in the youth group experience with the college students. In addition, the Archbishop had arranged our visit to a very well-equipped and staffed medical center that was bustling with patients from all faiths. This medical center is equipped and staffed much like we would see in the States. I was impressed. A refreshing difference was that this medical center contains a chapel in the waiting room! The first part of our week was filled with seeing these sites and getting to know two other families that are long-term missionaries with OCMC. During down times, each of us helped each other put the finishing touches on our small presentations that we would present during the youth conference later in the week. This was a great experience of learning from each other.